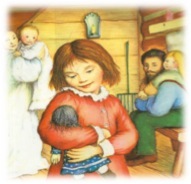 I Love the Little House books by Laura Ingalls Wilder. I love them because Laura’s recollection of her childhood, which is described in such vivid detail that it’s astonishing, is incredibly warm and loving. It reminds me of every thing a child’s life should be: happy, contented, safe and filled with love and laughter; and this, in spite of the “hard life” her family lived. Yet, that’s just what puzzles me. I think that the circumstances of her childhood were such that I would not want it for my children, but I wonder if she felt that way – that her childhood was hard and at times unbearable? If she did, it certainly didn’t come across in her writings. On the contraire, her childhood accounts engender feelings of warmth, love, hope, security, and a general feeling that all was right in the world, especially when her dad, Pa Ingalls was around. In her book Little House on the Prairie, this is how Laura recounts a move her family made from the woods of Wisconsin to the open prairie of Kansas . . .
Could you imagine the contents of your life being able to fit inside of a covered wagon? That wagon couldn’t be any bigger than the size of a pretty small bedroom. Obviously, Laura’s family had very little earthly possessions. Yet it seems like what they did have was more than enough for a child to live a good and contented life. What about us? How much do we need? I have to remind myself of Laura’s humble circumstances whenever my kids ask for material things that I can’t deliver on, especially since we are living on one income. I have to remind myself of that when I feel that we need more to be happy. Why do we need so much, anyway? The more I read the Little House books, the more I’m reminded that what children need most doesn’t come from anything that I can purchase at all. It comes from the love and discipline received and the values and principals instilled. It comes from parents who persevere in marriage and don’t quit on family when the going gets tough. Oh, how I love Little House!